The Sidebar: Anti-animal testing icon awards $343,000 for cancer research using animals; will PCRM revoke the Heimlich Institute's "Humane Charity Seal of Approval"? Anti-animal testing icon awards $343,000 for cancer research using animals; will PCRM revoke the Heimlich Institute's "Humane Charity Seal of Approval"? For decades, animal rights advocates have counted my father among their most prominent supporters. For example, in her book, One Can Make a Difference, PETA founder/president Ingrid Newkirk wrote, "(Dr. Heimlich) is staunchly opposed to animal experiments." According to this website, the president of an anti-vivisection group called Doctors and Lawyers for Responsible Medicine told the Jerusalem Post, "(Dr. Heimlich is) vehemently opposed to animal experiments." So what happens when like-minded members of the animal rights community find out that last year my father awarded hundreds of thousands of dollars to fund medical research using animals? How about the Physicians Committee for Responsible Medicine (PCRM)? According to the LA Weekly, my father's been on the medical advisory board of this animal rights advocacy group since 1986. PCRM even established the "Henry J. Heimlich Award for Innovative Medicine." Our video, Advances in Medical Education with Henry Heimlich M.D., which shows Harvard Medical School's outstanding alternative to old-fashioned medical school dog labs, won the Silver Plaque at the 1997 International Film and Video Competition. Produced by Steven Ragland and directed by Mark Schimmel, it was released to all medical schools and medical libraries in the U.S. and Canada. Our second video, Innovations in Trauma Training with Henry Heimlich, M.D., along with Human Anatomy-Based Trauma Training: An Implementation Guide, shows instructors exactly how to teach trauma care without using animals. Currently, trauma courses kill an estimated 5,000 dogs every year. PCRM's video was distributed to every Advanced Trauma Life Support instructor in North America. According to this 1996 article, PCRM founder/president Neal Barnard MD recommends donating money to my father's nonprofit because "(the Heimlich Institute) never sponsor(s) any animal experiments." 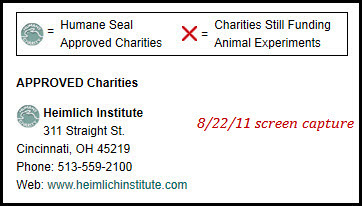 Charities that qualify are licensed to use the Humane Seal graphic on their educational and fundraising materials; the Seal's simple design quickly conveys the message: This charity is cruelty-free. PCRM administers the program on behalf of the Council on Humane Giving, a coalition of physicians and animal protection organizations. Charities wishing to apply for certification must sign a statement of assurance that they do not fund or conduct animal experiments. ...Thirty-some charities, including the Heimlich Institute...have received certification to date. 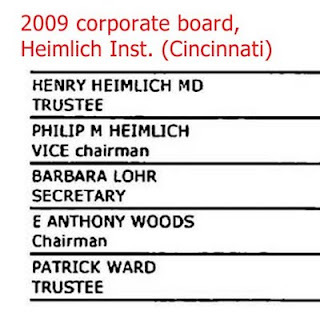 So how does the Heimlich Institute spend the money it receives from donors? 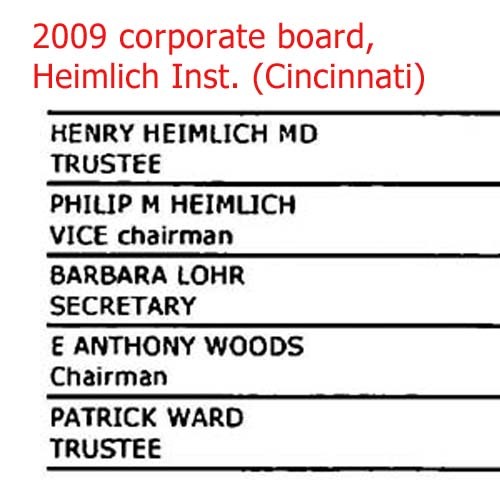 Last year, per this press release and media reports, the Heimlich Institute gave $500,000 to the University of Cincinnati's Hoxworth Blood Center. "As [Heimlich] starts to slow down, he wanted to make sure the money was used for purposes of saving lives," Sacher said. Jose Cancelas, MD, PhD, and Thomas Leemhuis, PhD, researchers at the blood center, will use the $500,000 gift to fund two projects: one looking at ways to eliminate cell damage in chemotherapy patients and the other aimed at creating cell therapies for immune-compromised pediatric patients. Last week I obtained some interesting related documents. Two weeks later, on behalf of the board, Phil wrote back that $343,000 was approved for the chemotherapy project. 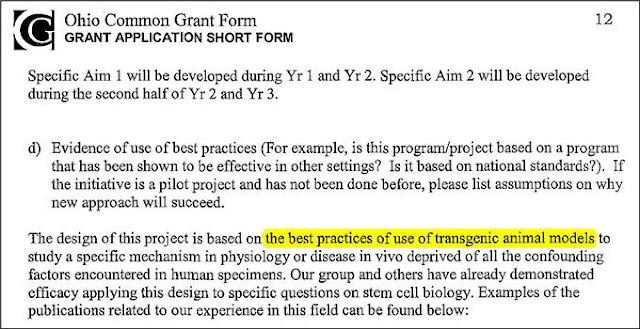 These are screenshots from the grant application for the chemotherapy study. 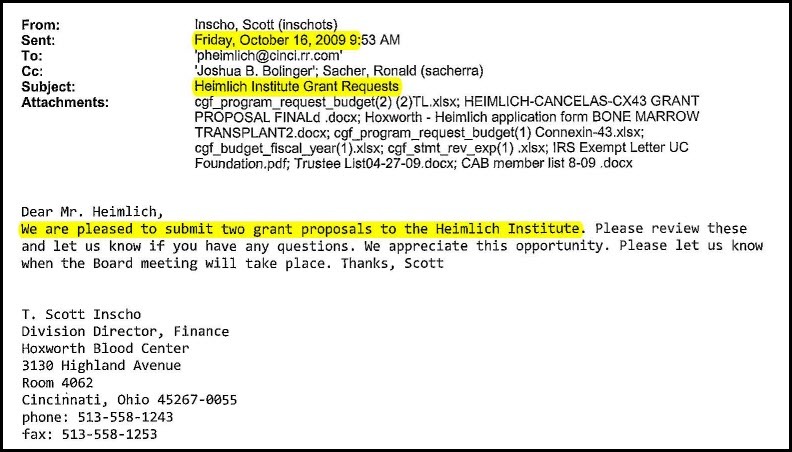 Among other questions, will PCRM remove the Heimlich Institute from their list of approved charities? I'll ask them and will report the results.